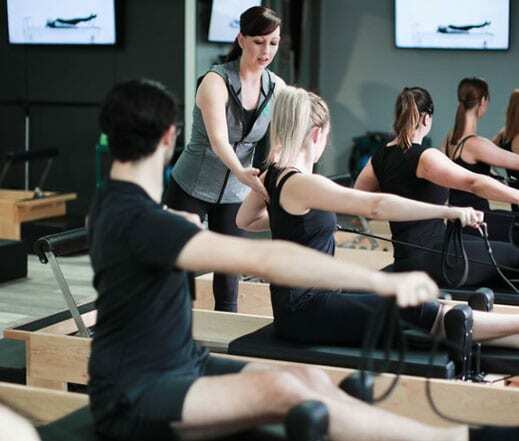 We offer all clients the chance to try a reformer class for free. Usually this is required before you can book into one of our group Reformer classes. If you are experienced with Pilates and feel that you do not need an introductory class, please contact us to be booked into a regular group spot. 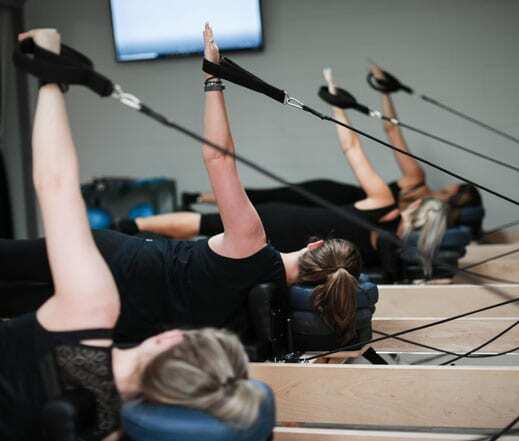 Our group Reform Studio classes are led by our qualified instructors and provide an all-over body workout using the reformer. If you have not done reformer before we recommend you attend one of our free introductory classes before joining Reform Studio classes. Studio classes suit a wide range of clients from beginner to advanced and our instructors will adjust the programmes to suit your individual needs. With a maximum capacity of only 3, our small group reformer classes are ideal for clients seeking more intensive and personalised attention. We offer all clients the chance to try a Mat Pilates class for free. Usually this is required before you can book into one of our group Mat Pilates classes. If you are experienced with Pilates and feel that you do not need an introductory class, please contact us to be booked into a regular group Mat class. Mat classes take place in our second studio area adjacent to the Reform Studio classes. These classes are led by Pilates specialists and are quite different to the mat Pilates classes you may encounter at gyms. Mat classes are suitable for all skill levels and use a range of accessories (circles, bands, weights) to enhance your workout. If you have just recovered from injury, are pregnant or post-partum, have major/multiple health issues or would just prefer more specialised instruction we recommend you start with private lessons. These classes may feature Reformer exercises, Mat or a combination of both. Most clients who start out doing private sessions with us are able to move onto group classes (if they choose to) within a few weeks. For those experienced at Reformer we offer discounted studio sessions during off-peak hours. Off-peak times are shown below and are generally in between morning and evening classes on weekdays; and after classes finish on weekends. These workouts are the same as our Reform Studio classes, but they are video-led only ie. there is no instructor present. Virtual reformer classes are most often used by members to top-up their membership; and to get more reformer practice in an economical way.